Cerodontha (Poemyza) phragmitidis Nowakowski, 1967;Spencer, 1972b. Handbk ident. Br. Ins. 10(5g): 104. Cerodontha (Poemyza) phragmitidis Nowakowski, 1967; Spencer, 1990. Host specialization in the world Agromyzidae (Diptera) : 356, 368 (fig. 1385), 369. Leaf-mine: A large linear-blotch mine in the leaf blade. 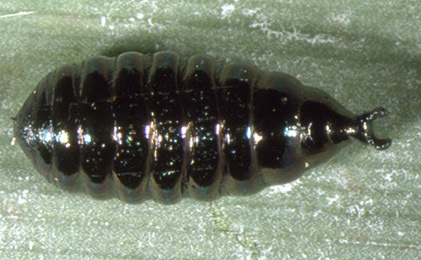 Pupation normally in the mine (Spencer, 1976: 190). 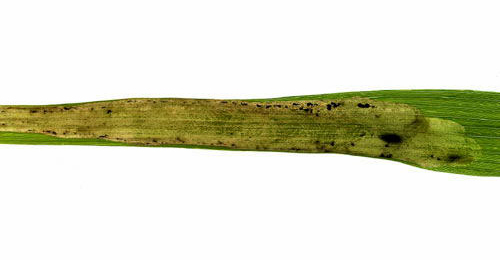 Elongated blotch, usually in the distal part of the blade. The mine is mostly interparenchymatous, less frequently lower-surface, and rarely upper-surface. Rather little frass, in fairly large grains, scattered in the mine. Larva generally solitary. Pupation almost always within the mine (Bladmineerders van Europa). Metallic black, deeply segmented, narrowing at hind end; posterior spiracular processes knob-like, each with 3 bulbs, at each corner of a large, almost rectangular projection (Spencer, 1976: 190). The puparium is illustrated in Bladmineerders van Europa. Time of year - mines: June-September, less often also May and October (Bladmineerders van Europa). Distribution in Great Britain and Ireland: Widespread (Spencer, 1972b 104) including Warwickshire (Dosthill) (Robbins, 1991: 137); Cambridgeshire and Glamorgan (NBN Atlas). Distribution elsewhere: Widespread in continental Europe including Denmark, Sweden and Estonia (Spencer, 1976: 190), The Netherlands (Bladmineerders van Europa), Belgium (Scheirs and de Bruyn, 1992) and Germany (Spencer, 1976: 554), Czech Republic, French mainland, Hungary, Lithuania and Poland (Martinez in Fauna Europaea). Also recorded in Japan (Spencer, 1976: 190).